Clare defender Ciaran Russell was sent-off after 43 minutes. AN OUTSTANDING RETURN of 0-9 from Donie Smith proved pivotal in helping Rocommon to a seven point win over Clare. This was just Clare’s third home league defeat in five seasons and while Roscommon were the better team, they were significantly aided by the dismissal of Ciaran Russell. The Clare wing back, who operated as sweeper, was red carded eight minutes into the second half. Smith had just put Roscommon into a 1-10 to 1-8 lead and while Clare kicked some decent scores subsequently, Roscommon introduced Cathal Cregg who put away 1-1. His goal was set up by the outstanding Smith. The winners, who go into their remaining two fixtures with a realistic chance of promotion, led 1-9 to 1-7 at half-time. Ironically, Clare made the better start with David Tubridy goaling in the third minute, following excellent build up play involving midfielders Cathal O’Connor and Gary Brennan. Roscommon remained calm however with Conor Devaney kicking 0-2, while Ciaráin Murtagh and Smith also put over crucial first half points. However the key score was Diarmuid Murtagh’s goal, 13 minutes from half time. Roscommon won a Clare kick out and Murtagh played a nifty one-two with full back John McManus, before finishing superbly. Playing in front of an attendance of 1,643, Clare rallied at times in the second half with points from Eoin Cleary, Tubridy and Sexton. When Cathal Cregg netted Roscommon’s second goal, nine minutes form time, that all but sealed the result. Gary Brennan did raise a green flag for Clare, operating at full forward but Roscommon responded with points from Smith and Cregg to seal the result. They now sit on seven points, while Clare remain on four. Cathal Cregg 1-1, Diarmuid Murtagh 1-0, Conor Devaney 0-2. Scorers for Clare: Eoin Cleary 0-5 (0-2f), David Tubridy 1-3 (0-3f), Gary Brennan 1-0, Keelan Sexton 0-2, Pearse Lillis 0-1, Seán O’Donoghue 0-1. 23. Conal O’hÁinféin (Éire Óg) for Seán Collins (66). Email “Donie Smith hits 0-9 for Roscommon as Clare suffer just their third home league defeat in five seasons”. 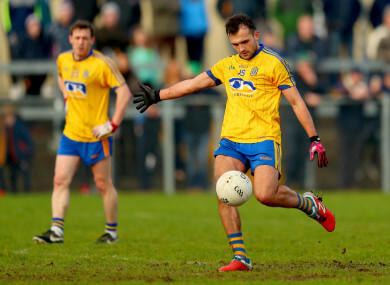 Feedback on “Donie Smith hits 0-9 for Roscommon as Clare suffer just their third home league defeat in five seasons”.